The Razer Blackwidow offers some of the best tactile feedback among mechanical keyboards. It is constructed of high quality with a metal base and has some of the most durable mechanical switches on the market. The mechanical switches from Razer offer some truly fast and responsive gameplay. The keyboard has an obvious focus on gaming optimization with its user-friendly Razer software. The lack of extra features, do not manage to ruin this great gaming keyboard. We would recommend it to any avid gamer, looking for a new mechanical keyboard. If you are looking for a ”clicky” mechanical keyboard, then this a fantastic pick for you. Is the new V2 worth it? Yes, but only because there is no big difference in price between the v2 and v1 version of the Blackwidow. Related: Top 10 Mechanical Keyboards for Gaming. The Razer Blackwidow have a lot of different variants, with various price tags. So let’s start off by clarifying the difference. The Chroma and Ultimate Blackwidow are exactly the same keyboards, except for the RGB lighting system in the Chroma, allowing for greater LED customization. This extra feature will cost you quite a lot of extra money, but won’t make any difference in terms of the keyboard’s performance. The Stealth version of the keyboard is the same as the Ultimate, but uses orange mechanical switches, instead of the standard green. This makes a very little tactile difference but is a lot more silent than your regular mechanical keyboard. So if you want to avoid annoying others when gaming or typing, the Stealth version is a solid pick. The Ultimate is the baseline Blackwidow keyboard, but in terms of performance, mechanical feel and quality, it is exactly the same as the other, more expensive options. For this review, we used the Razer Blackwidow Ultimate 2016 edition, so the review should be relevant whether you want the Chroma, Stealth or Ultimate version. V1 or the new V2? The difference between the original and the new V2 is very little. However, the price difference is even smaller, so we do recommend you pick up the newer more updated version. Although the normal Blackwidow will still do just fine. Yellow switches(optional) – This is Razer’s answer to the Steelseries Crossfire keyboards and the MX Cherry red switch. It is the first linear switch to be added to the Razer switch series and for fans of linear switches, it is certainly a welcomed addition. Wrist rest – This one is excellently done by Razer. The wrist rest is magnetic, which makes it such an ease to remove/add, on top of that it is a very strong magnet, which means it won’t detach by mistake. It is also very comfortable and the option of playing with a wrist rest is always nice. Cleaner LED indicators – Easier to see if caps lock etc. is turned on or off. 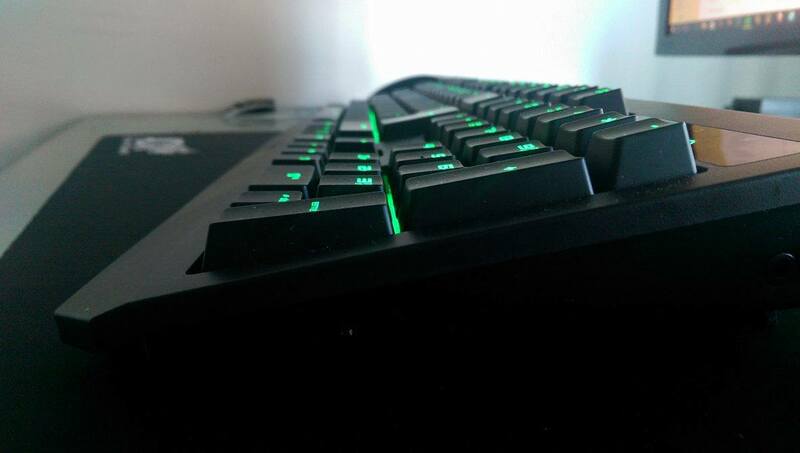 The Razer Blackwidow Ultimate and Chroma uses the Razer green switches. Which offers a very clicky mechanical sound and fast, tactile feedback. Razer Green Switch: Is the default switch used in mechanical keyboards from Razer. It is used in the Razer Blackwidow Chroma and Ultimate and is designed to give a distinct mechanical click sound and fast tactile feedback. Razer claims that it register clicks almost twice as fast as most regular mechanical switches, which is quite impressive. Claiming that it is twice as fast at registering key presses is probably not entirely fair since you cannot compare a quite expensive gaming keyboard to regular keyboards. Razer Orange Switch: Is the one used in the Ultimate Stealth version of the Blackwidow. It is extremely similar in feel and performance but is designed to be silent and almost entirely without clicking noise. In terms of tactile feedback, the orange switches is actually a little faster than the regular green, but it is NOT something you will notice at all. But giving people a quieter option is always nice. Designed for Gaming: Razer was the first gaming brand to design mechanical switches designed specifically for gaming. Razer has won a ton of rewards for the fast, responsive switches. Mechanical switches are something that Razer has truly mastered and both the orange and green version offers extremely fast and responsive gameplay. On top of that, they are insanely durable, and can allegedly last for around 80 million keystrokes, which is 30 million more than a regular keyboard. For those who don’t know, not all gaming gear is acceptable at big, official esports tournaments. The mechanical Razer switches are however esports validated, which means they can be seen used by professional gamers at big esport events, such as ESL tournaments. Related: Big fan of Razer? Then you should check out our favorite Razer gear. The keyboard offers true quality for the money, with its metal base and durable key switches. Razer generally has a bad reputation for making half decent quality products. This keyboard does however not fall into that category. The solid metal construction and sheer weight give an immense feeling of quality. This is topped off by the insane durability of the mechanical switches, which is said to last for 80 million keystrokes. On top of this, Razer offers 2 whole years of warranty. Even if you do happen to break a key, they are very easy to replace and very easy to get a hold of. It is obvious that immense testing went into making this keyboard. The design is quite clever and offers a great amount of comfort in its shape and size. The keyboard has a slightly curved design, which grants a very natural feel to its ergonomics. We were sad to see that there is no possibility for an optional wrist rest, but it was honestly not something we missed at all when reviewing it. The 2 backflips do offer some sort of customization to the ergonomics, but that is about it. The entire base of the keyboard is made out of solid metal with a quality top cover. It is possible to get this keyboard in a complete metal version, which is the Razer Blackwidow X Chroma/Stealth/Ultimate. For this, you play quite a substantial extra amount of money for a very small improvement. We don’t recommend the X version unless you don’t mind spending a lot for minor tweaks. The keyboard has a braided multi-cord wire. The quality is great and you don’t have to worry about the wire’s durability. 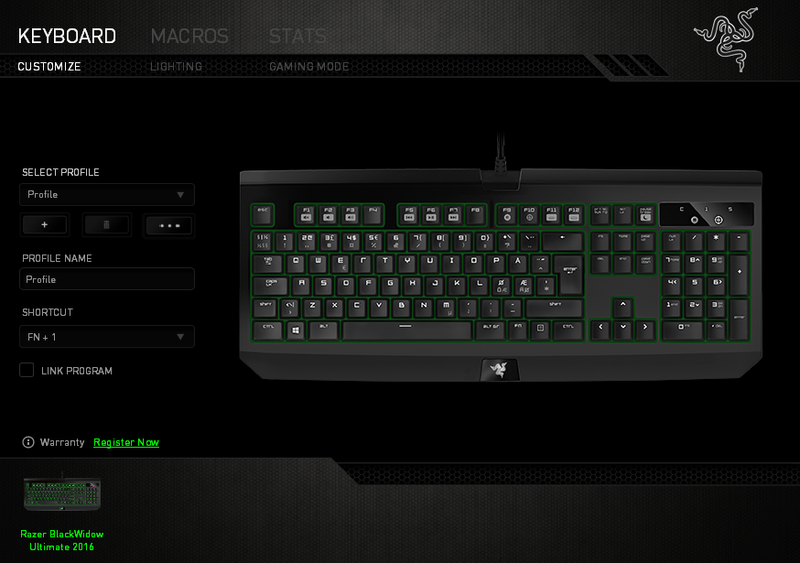 The keyboard uses the Razer Synapse gaming software and can be synchronized with all your other Razer gaming gear. This software is easily found and downloaded from Razer’s official website. A simple search for ”Razer Blackwidow software” will do the trick. The software offers macro management,game-specificc profiles, LED lighting customization, and even button/key stats to evaluate your gameplay. LED Lighting: This is where owners of the Chroma version can really have some fun. Offering over 16 million different colors and nuances, for you to toy around with and find the perfect look for you. The Ultimate version has the default Razer green LED light and cannot switch colors. There is however 6 different options for how the LED works and most of them look pretty amazing. You can choose between static, ripple, starlight, wave, reactive and breathing, Each offers very different and interesting looks. This is where the keyboard falls quite short. it offers next to no extra features other than the media outlet and ”game mode”. Game mode: This feature sounds great on paper, but is quite a disappointment. It simply allows you to disable various keys, such as the windows button, while you are in-game. This can be pretty useful but is ultimately a letdown. Media Outlet: This was a nice extra touch. On the right side of the keyboard, there is 1 USB and 1 jack stick plugin. Allowing you to easily add your mouse, headset or phone charger, while also offering an easy plugin for your media devices. Anti-Ghosting: Was a bit of a letdown, since it wasn’t 100% anti-ghosting. While the keyboard does have some anti-ghosting, we would have liked a complete rollover keyset. However, when do you ever press more than 10 keys at once?